The Warrego Highway to Charleville is a dead straight, fairly monotonous road and no speed limit as far as we knew. We learned early to get out of the way of those roadtrain-cattle trucks that came thundering along; I started to believe that some of those truck drivers were frustrated fighter pilots! 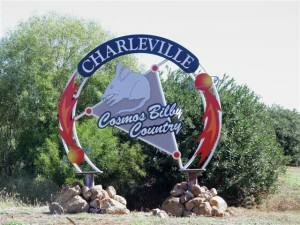 I was really looking forward to our stay in Charleville, a town I’d heard so much about when I was growing up. The history of this region dates back thousands of years with aboriginal people living in this area for generations. With its flat plains and mulga forests, it is a great habitat for wildlife and that meant good hunting. Charleville’s recent history began in 1847 when the first European explorers arrived and in 1865 several hundred acres was set aside for the township. It wasn’t until 1868 however that the town was surveyed and building commenced. 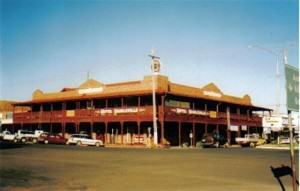 Today, this great little outback town is a major community in Outback Queensland. The day had started out sunny and warm but as we’d been travelling we’d been watching the clouds build up for some time and finally, when we were about 30 kilometres (18 miles) out of Charleville, the heavens opened up. Just great! We arrived early afternoon and checked in at the Bailey Bar Caravan Park ([star][star][star][star]) in King Street. 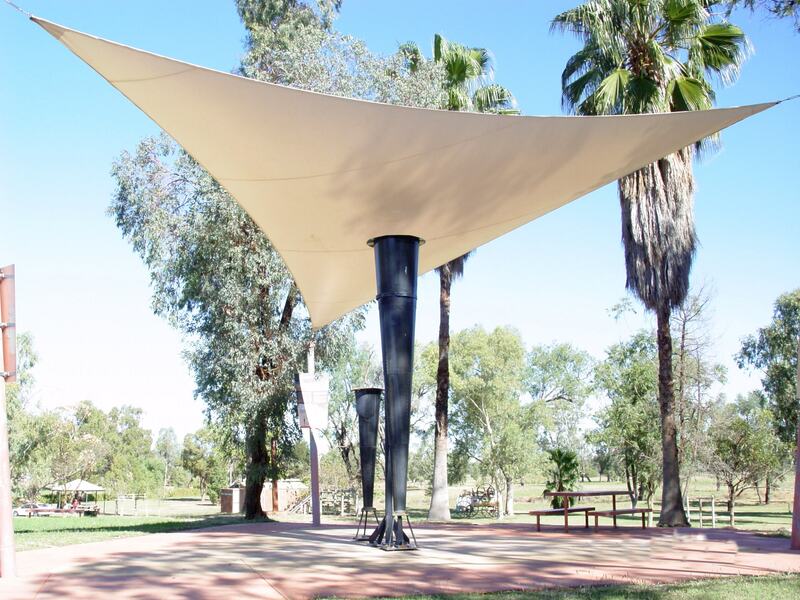 The park is big and well laid out and they frequently offer some true outback entertainment in the winter months with a “happy hour” and a bush poet. It didn’t take long for us to set up camp but the rain kept tumbling down and our plans to visit Charleville’s “star” attraction, the Cosmos Centre, that evening were rapidly falling apart. With the heavy cloud and rain falling steadily, it didn’t look good and our spirits were just about as gloomy as the overcast. 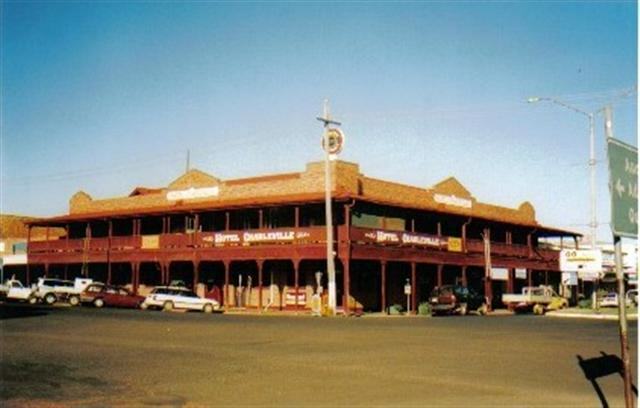 When I was growing up my Dad used to talk about Charleville and particularly the Hotel Charleville and how much he would like to visit there. Sadly he passed away before he could do that but I thought I would like to go down and visit the hotel and so later that afternoon we drove into town, to the Hotel Charleville, to have a drink for Dad; I think he would have liked that. I was very surprised to find that we were the only one’s there, after all, it was a Friday evening and I really thought the place would have been crowded. Oh well, times change, I guess. 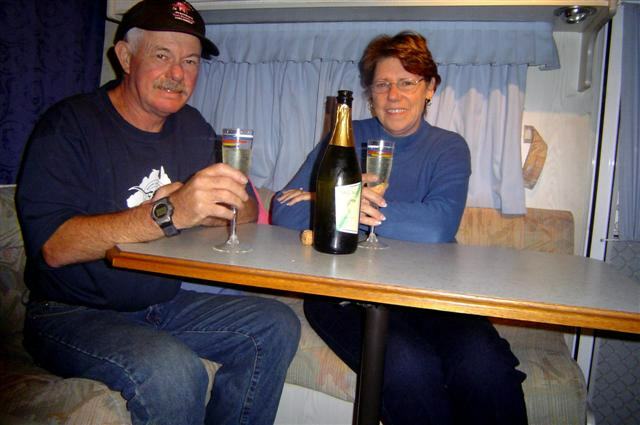 When we returned to camp we settled in for a quiet evening with dinner and our bottle of Two Tails Sparkling Wine. With the rain still falling and the temperature having dropped dramatically, staying indoors was a good idea. We weren’t late getting to bed that night but getting John up early is no easy task, even though he was the one who wanted to go shopping to buy a pair of jeans. Still, he groaned and complained and didn’t want to move until I explained to him that this is Outback Queensland; there’s no Saturday afternoon shopping here and if he wanted his jeans and, more importantly, if he wanted to eat that night, then we had to go shopping now! The rain was gone and there wasn’t a cloud in the sky on what promised to be a beautiful day as we set off for town. The hustle and bustle (!) of Saturday morning shopping in Charleville was an experience. We found a place to park without having to drive around for half an hour, there were no long lines at the store check-outs, almost everyone smiled and said “g’day”, total strangers would have a chat, and absolutely no one seemed to be in a hurry! It was like being on another planet and we loved every minute of it! Our shopping done, it was time to do a little exploring and we set off for Graham Andrews Parkland to see Charleville’s famous Vortex Rainmaking Guns. 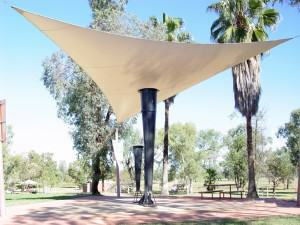 Part of the fascinating history of Charleville, in 1902 the state was in the grip of a crippling drought and the desperation to produce rain led to a somewhat unique solution. Queensland’s first Government Meteorologist, Mr. Clement Wragge, began experimenting with the Steiger Vortex Guns, designed to break up hail over vineyards in Italy. He had six of these guns made in the vain hope that they would produce rain. These vertical guns were placed throughout Charleville with their barrels pointing directly up into the sky. They were charged with gunpowder and when they were fired the resulting explosion would change the atmospheric pressure and therefore produce rain. Well, that was the theory, anyway. History doesn’t record the name of the man who “pulled the trigger”, so to speak, or whether he survived the blast. Suffice to say, the experiment was a dismal failure and the drought continued for some time. Today, only two of the guns remain intact and they’re proudly preserved and displayed in the park. Mr. Wragge, however, was not forgotten for his efforts and he became the first person to name a cyclone in Australia. Initially he named them after politicians because he said they were both natural disasters and blowhards! Our next stop was The Charleville Historical Museum. Historic House, which houses the museum, is the oldest permanent building in Charleville. It began its long life as a modern banking chambers and manager’s residence in 1888 and continued until 1942 when it was purchased as a private residence. 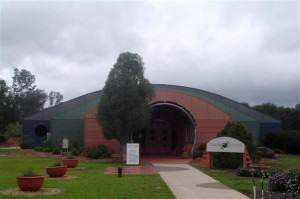 It wasn’t until 1973 when the property was purchased by the Charleville and District Historical and Cultural Society that the museum was born. 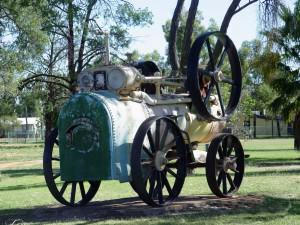 Over the years it has collected all manner of things from bric-a-brac to a fully operational 1923 Dennis Fire Engine. There is a Marshall Portable Steam Engine and a replica Cobb & Co coach as well as the original charge room from the local police station in the grounds. We spent some time looking at books, maps, and personal papers, including letters, that are more than 100 years old and these, alone, are quite valuable in terms of their historical significance. I read some pages of a diary that had belonged to a lady who called her husband “Mr. Carson” from the time they first met until the day she died. A different time, indeed. 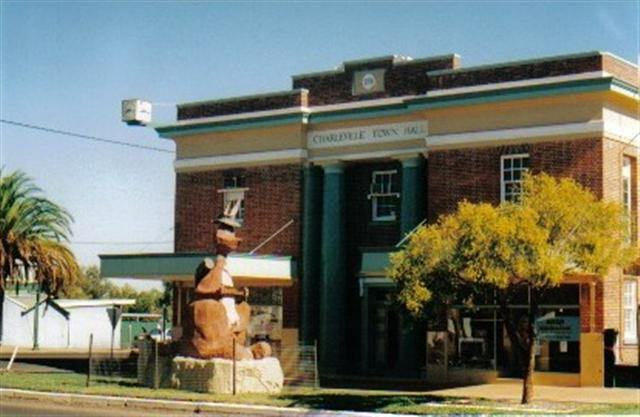 The streets of Charleville have many carved statues that depict native animals in curiously human ways, for example, a kangaroo in a top hat. It’s different and contributes to the friendly and cheerful atmosphere in the town. The mosaics embedded in the footpaths (sidewalks) tell stories of the Dreamtime and how those animals came to be here. The culture of the Outback revolves very much around the Aboriginal people and one of my favourite Dreamtime stories tells of how the turtle got those markings on his back. It seems that Emu and Turtle were enemies and Emu was running away from Turtle but she needed to let her friends know where she was. She needed to draw a map and leave it in a place where Turtle would never see it and so she drew it on his back. Fishing in Charleville? Oh yes! It was while we were at the Museum that John struck up a conversation with one of the locals. Now, this man, who had absolutely no idea that he was standing on very thin ice, informed John that this was the weekend of the Annual Charleville Fishing Competition. And so, with John armed with bait and me with gritted teeth, that afternoon we spent a couple of hours on the banks of the Maranoa River, with the usual results I might add. There were several people there for the competition and the odd shout meant that somebody did catch something but the water was still very muddy from recent rains and I expect that any fish caught were soon thrown back in. But, for me, Charleville has but one attraction, the Cosmos Centre. And nothing was going to keep me from it. Located on the outskirts of town next to the Bureau of Meteorology and Charleville Airport, the unique design of the building is supposed to represent a spiral galaxy. We arrived for the night show with only a few minutes to spare before the start and the crowded parking lot meant it was definitely a full house. A moonless, cloudless night, it promised to be fantastic. We were escorted to the open air observatory and given a talk by a couple of the Astronomers there before they set up the digital telescopes for our first look at the skies. The unique location of the Cosmos Centre’s Observatory meant there was no unnecessary light from traffic or the town to dazzle us and spoil our night vision. And flash photography during the show was a definite no-no. The only dazzling was from those distant pinpoints of light above us. This was not a new experience for me by any stretch of the imagination but for John it was all new. Yes, he was a Galactic Virgin! He was amazed as he tracked in on objects never seen with the naked eye. The unimaginable distances were mind-boggling. With the guidance of the Astronomers we looked at an object called Orion’s Nursery where new stars are born and a nebula called a Globular Cluster where stars are dying. Another nebula called The Jewel Box has literally millions and millions of stars and they look like diamonds scattered across the sky. And then we had a look at our next door neighbour, the nearest star to us other than our own sun, Alpha Centauri, a mere 44 trillion kilometres away (don’t even ask me to work that out in miles!) Alpha is a binary system with two stars orbiting around each other. It takes 88 years to complete one orbit and there is only 3 billion kilometres between them. It would be cataclysmic if one of them wobbled! Then we were looking in our own back yard at Jupiter and a couple of her moons, and Saturn in its 1-in-14 year configuration (side on like a dinner plate on its edge). The Astronomers finally turned our attention to the constellation of Scorpio, rather fitting as it is John’s star sign and it was while all eyes were turned to the heavens that we saw a brilliant shooting star. It was a perfect end to the evening and we couldn’t have asked for more. Our sixty minutes seem to have flown by and all too soon it was time to leave but the day show promised to be . . . well, if not as spectacular, at least close and on our way out we purchased tickets for the next day. The heavens had smiled on us, weather-wise, but sometime during the night the clouds rolled in and the rain started again. It’s all out of this world! It was late morning when we set off for the Cosmos Centre and the day show and the grey, dull day was the furthest thing from my mind. We spent several hours wandering around, and playing with, all the interactive displays and even got to hold a meteorite in our hands. The staff were very helpful and friendly, answering our questions with patience for they must have been asked the same questions by tourists every single day. Lunch time came and went with a quick snack in the café and the day wore on. I didn’t want to leave; there is so much to see and do here. But we couldn’t stay all day and John was starting to make grumbling noises about his head spinning from it all and so it was time to go. Yabby races at the Bailey Bar! The sky was still overcast when we left the Centre and returned to our camp. John had heard about Bailey Bar’s yabby races and was anxious to see for himself and maybe even have a bet on a race. Well, he didn’t have any better luck with a yabby than he did with a fishing rod but he had fun and it was all in aid of a good cause; all proceeds went to the Royal Flying Doctor Service. Our few days in Charleville had been magical but it was now time to move on and we spent the late afternoon and evening packing up the camp for an early start. The sun was attempting to peek through the clouds and it looked like the rain was clearing as we settled back for a quiet evening. Perhaps one day we’ll back. I hope so; there’s much more to Charleville than our few days allowed.